From the moment soprano Charlotte Hoather, playing mama bird Uccellina, opens her mouth, the audience is rapt and silent, and, a couple of mini-meltdowns aside, remains that way. Particularly impressive considering that the audience is largely aged 6– 18 months. 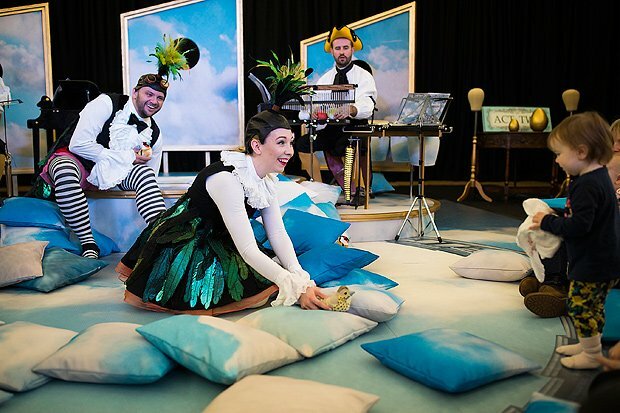 Scottish Opera has created BambinO especially for under-2s, staged in an open space stuffed with sky-blue cushions to grab and small fluffy toy birds to cuddle. Opera has an unfair reputation for being inaccessible, so opera for babies might sound like a ridiculous Tiger Mom-style parody, but it works brilliantly. The exaggerated, performative facial expressions are hugely appealing to babies – Hoather's gorgeous, animated eyes earn lots of gummy smiles as she roams the room – while parents might find themselves becoming a bit teary at the simple story, where Uccellina has to let her chick, Pulcino (baritone Timothy Connor, delightfully childlike) fly away. The staging for the Fringe leg of the tour is perhaps squashed into too small a room, meaning that despite assurances of this being a free-range space, toddlers are consigned to a row of seats behind the babies, which can be a bit of a struggle for anyone wrangling a particularly curious mobile small person. However, once the production transfers to Scottish Opera HQ in Glasgow in October, there should be far more space for little birds to fly. Edinburgh Academy, until 20 Aug (not 14), 10am & 11.30am, £12 for adult & baby; £7 for additional adult. Scottish Opera's opera for babies aged 6–18 months.